Take a magic carpet ride around the globe. Rapunzel’s parents’ castle in “Tangled” was inspired by the fortified island village and castle of Mont Saint-Michel. Although only around 40 people currently live on the island, Mont Saint-Michel is one of France’s most recognizable landmarks and is visited by more than 3 million people per year. The design of the oceanside castle where Prince Eric lived in “The Little Mermaid” was reportedly influenced by the Chillon Castle in Switzerland. Interestingly, the structure you see today wasn’t built all at once. A collection of 25 smaller structures were initially constructed, then gradually over the years the buildings were connected to form the castle that now exists. The gorgeous falls in “Up” were inspired by Angel Falls in Venezuela, which is the world’s highest waterfall with an uninterrupted fall of 3,212 feet. Director Pete Docter and some of the artists who worked on the film apparently visited Canaima National Park to witness the falls firsthand. The Loz Feliz cottages that inspired the home of Snow White and the seven dwarfs were built by architect Ben Sherwood in 1931. In fact, census records show one of the animators who worked on “Snow White” actually lived in one of the eight Loz Feliz cottages in the late 1930s. The style of the “poor provincial town” where Belle and her father live was heavily influenced by the small villages and towns of Alsace. It’s widely known that the Sultan’s Palace in “Aladdin” was inspired by the Taj Mahal. However, unlike the palace in the film, the Taj Mahal isn’t actually a residence — it’s a tomb that was built by Emperor Shah Jahan in 1632 for his favorite wife, Mumtaz Mahal. Of all the Disney palaces, Elsa’s ice castle in “Frozen” probably seems like the least likely to be based on a real place, right? Well, turns out it was actually inspired by Hôtel de Glace, which is an actual hotel in Quebec City. Director Chris Buck even stayed at the hotel to study the ice structures and learn more about snow construction. The design of the chapel where Elsa’s coronation takes place in “Frozen” was influenced by St. Olaf’s Church in Balestrand, Norway. Technically, the city where Tiana lives in “The Princess and the Frog” isn’t based on New Orleans—it is New Orleans! Numerous locations from New Orleans are depicted in the film, from historic buildings in the French Quarter to the swampy lakes of the bayou. Often called the “Stonehenge of Scotland,” the Calanais Stones were erected over 5,000 years ago, meaning they’re even older than Stonehenge! Although the exact purpose of the Calanais Stones is unknown, it’s thought that they served as some kind of astronomical observatory. Not only do the hills look similar, but Machu Piccu is located in the city of Cusco, and the emperor’s name in “The Emperor’s New Groove” in Kuzco. Though it’s spelled differently, it’s pronounced the same way. According to director John Lasseter, many of the locations and attractions in “Cars” were inspired by a road trip he and his family took along Route 66. One such example is Ramone’s Body Shop, which looks almost identical to the real-life U-Drop Inn. 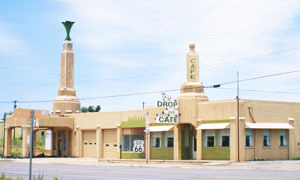 Built in 1936, the U-Drop Inn is an art deco gas station and restaurant that’s considered a classic example of Route 66 architecture. Though it officially closed for business in the late 90s, the U-Drop Inn was restored and reopened in 2003 as a museum and gift shop. The castle in “Sleeping Beauty” was inspired by Neuschwanstein Castle in Bavaria, Germany, which was built in 1892 by King Ludwig II. The Emporer’s home in “Mulan” was very clearly inspired by the Forbidden City in Beijing, China. Interestingly though, the movie is set during China’s Han Dynasty, which ruled from around 200 BC to 200 AD, but the Forbidden City wasn’t actually built until 1420. Although the story of “Atlantis: The Lost Empire” is loosely based on the legendary sunken Greek island of Atlantis, the visuals were inspired by Angkor Wat in Cambodia. Originally built as a Hindu temple before gradually transforming into a Buddhist temple, Angkor Wat is the largest religious monument in the world.